Have you seen Guardians of the Galaxy yet? 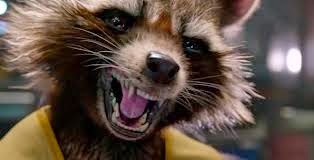 I have not, but I'm really looking forward to meeting Rocket, the foul-mouthed, crotch-grabbing raccoon-like creature voiced by Bradley Cooper. He's one of the crew of intergalactic misfits, but he's far from the first raccoon to appear prominently in our pop culture multiverse. Keep reading for a list of other notables furry bandits. 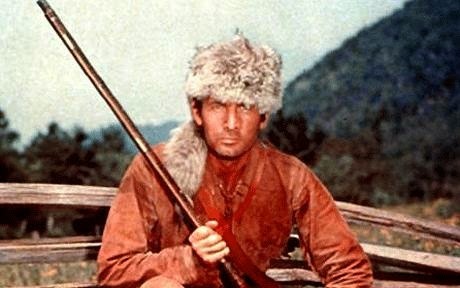 Davy Crockett's coonskin cap —This one's a little sad, but it's burned into the American national conscious and was particularly popular with kids in the 1950s thanks to the Disney show. Unfortunately, these hats usually had real raccoon tails on them. Wikipedia side note: Girls wore Polly Crockett hats, which had all-white fur. Second Wiki note: At the height of their popularity, 5,000 caps sold every day. Let us speak no more of this. Bright Heart Care Bear —I'll admit it: I never had a non-bear Care Bear. (I was a Care Bear racist like that, I guess.) But I think Bright Heart, perhaps the smartest of the bunch, would've been an absolutely worthy addition to my childhood stable of Care Bears. 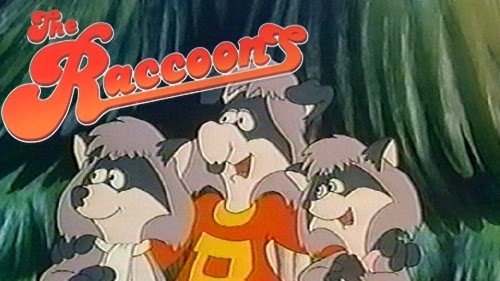 The Raccoons —This Canadian cartoon ran from 1985 to 1991 and followed the adventures of three raccoons who were usually found trying to stop the subtly named Cyril Sneer, a millionaire industrialist who wanted to ruin their forest. Rascal the raccoon —Two kids in Wisconsin take in an orphaned raccoon kit, who is good at being adorable. 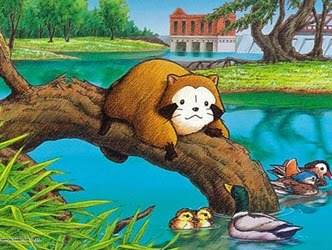 This cartoon was so popular in Japan that it led to thousands of raccoons being imported for adoption. 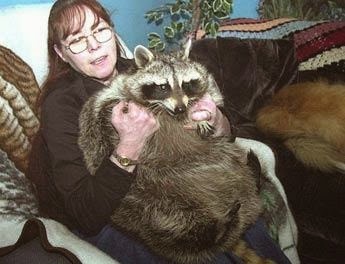 Bandit, the world's fattest raccoon — Born 1994, died 2004, Bandit is named the world's fattest raccoon in the Guinness Book of World Records. Bandit was raised alongside a litter of canine puppies and was eventually adopted by a woman in Pennsylvania. He had a thyroid condition and weighed 75 pounds at his death. He knew how to live life, presumably. 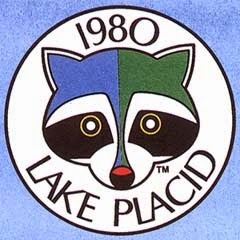 Ranger Rick —The hat-wearing raccoon is the mascot of the children's nature magazine that we all loved growing up. In recent years, he and his pals have taught kids about recycling, invasive species, overfishing, and geocaching, plus the joys of the great outdoors. 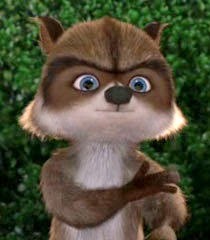 RJ from Over the Hedge —I ... have not seen this movie, but the raccoon looks cute and is often mentioned on the Internet, so RJ gets a place on this list. Keep doing whatever thing it is that you do, RJ. 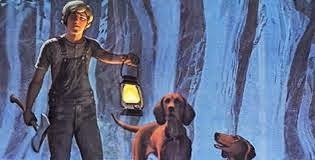 The raccoons from Where the Red Fern Grows —You know what? Forget I mentioned it. I have to go cry for an hour now that I thought about this book again. 1980 Olympic mascot Roni —I want to make it very clear that I'm too young to remember these Olympic games or this particular mascot. But look! How cute! Way better than more recent mascots, anyway. So where will Rocket fit into this pantheon? We'll see, but something tells me he'll bring a tart edge to some of the sweetness on the preceding list. Meeko! My favorite part of Pocahontas was that raccoon! Aww, I forgot about him! He was much-needed humor in that movie. Over the Hedge is also a syndicated comic strip. I don't read it; I just thought I'd point it was a comic before it was a movie (which I also haven't seen). 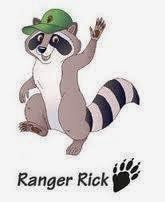 Ranger Rick looks different from how I remember him. When I was a kid he wore the hat of a- well, a ranger. Now it looks like his name should be Baseball Player Rick or something. I imagine someone decided a raccoon with a baseball cap was "cooler" or easier for kids to relate to than a raccoon with a ranger's hat. I watched The Raccoons growing up, though I don't remember it super well. One thing I do recall is the vague sense that the new wave soundtrack felt oddly out of place in the show; in fact, it kinda gave me the creeps (though I like "Run With Us"). I also remember being confused by certain elements, such as how the human characters could remain ignorant of this rather advanced, industrialized society of talking animals that existed practically in their own backyard. Then the humans disappeared altogether, which was also confusing. And then they did a movie where the characters were from outer space, and I was years away from grasping the idea of alternate continuities, so that was another thing that was baffling to my young mind, plus it probably is what led me to believe Cyril Sneer was an alien. I mean, he sure as heck didn't look much like an aardvark or any other type of animal I could identify.